Hoarding photos of random urban phenomena is, I realize, a bit eccentric. Not everybody finds joy in a catalog of coal shed windows, or in carefully documented iterations of downspouts. So when I've found projects that echo my own, I've audibly shrieked, physically trembled, even hyperventilated. "One more member of our lost tribe!" ​I've been heartened to learn that the technique I call Documentary Urbanism, where I trace patterns in the urban landscape, is not actually a personal invention or solitary impulse. Given that so many other strangers are out there with the exact same hobby, it seems there's some deeper human predilection at play. Some people just have a need to explore and order their world, to file it into folders and share it with people. ​Here, I present to you nine projects that are uncannily close cousins to Walking Almaty. If you're a fan of my project, these will be easy recommendations. Sardar is a talented young photographer from Almaty who has been similarly seduced by shuba, nalichniki, and the architectural surfaces that give homes here their distinct character. 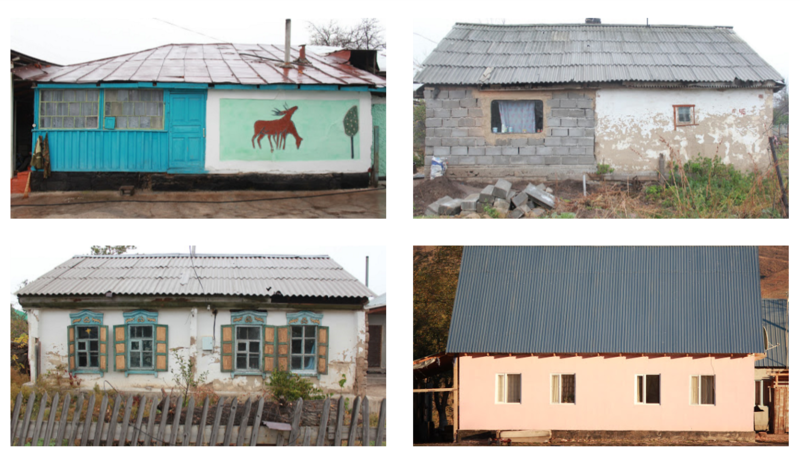 As part of a workshop with the famous Russian photojournalist Valery Nistratov, organized by TEDx Almaty last year, Sardar and several other promising artists documented life in the nearby village of Karakemer. Some of the participants focused on social issues, others on personal portraits, but Sardar was drawn to the place's built environment, and the work he produced, published here for the first time, is impressive in its framing and warmth. 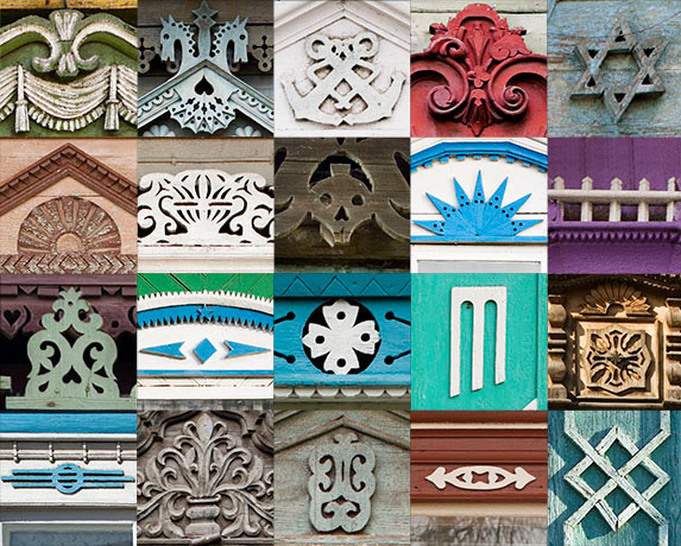 I am not, it turns out, the first foreigner to fall in love with the carved windowframes, or nalichniki, of Almaty. 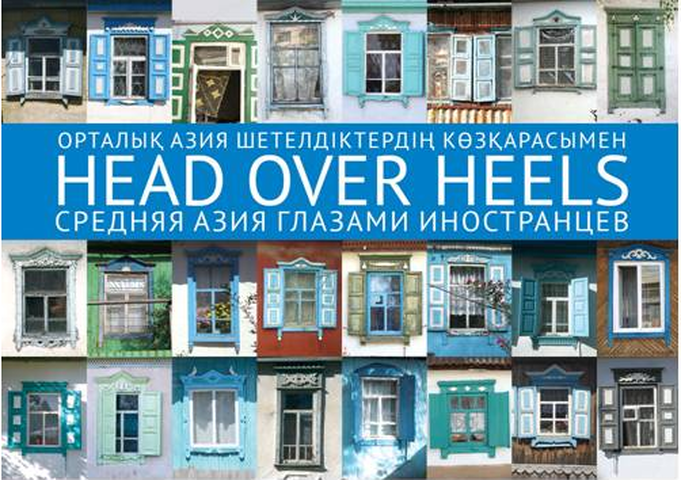 The Irish artist and photographer Mary O'Connor lived in Almaty for several years starting in 2003, and she adored the city's blue and green shutters so much that she put them on the cover of her coffee table book, Head Over Heels. The book, subtitled "Central Asia Through the Eyes of Foreigners," is devoted to the region's people and culture as well, but it seems that Mary's ethnographic approach and outsider perspective lend themselves particularly well to documentary urbanism. I was disappointed when the artist informed me that the book had a small printing and is all sold-out, but the sequel, Chai and Chat, can still be found at the gift store at Almaty's Shymbulak ski resort. Speaking of nalichniki, I've long been astounded by Ivan Khafizov's project devoted to this unsung folk art of Russia. Ivan has travelled extensively through his homeland, photographing truly fantastic wooden masterpieces for his "Virtual Museum of Decorated Windows." An Almatian like me, seeing the artistry and detail of these woodcarvings from Russia, can start to feel a bit outclassed. Our windowframes, let's be frank, truly cannot compare! The palate and forms of Almaty nalichniki are limited in comparison. Yet Ivan's work doesn't so much intimidate as it inspires, driving me to keep exploring Almaty's older quarters, in search of some still-hidden gem. Of all the projects I'll be sharing here, it's Christopher Herwig's book "Soviet Bus Stops" that has most captured the public imagination at large. I'm quite envious, to be honest, of the fawning coverage and viral news items his work has gathered, but it's undoubtedly deserving. Just look at these beauties! 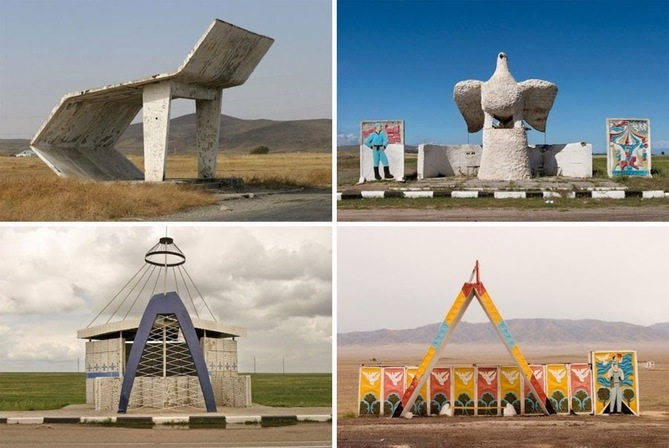 Some of the finest sculptural bus stops featured in the book came from Chris' road trips through Kazakhstan, and he even lived in Almaty for a time. I hope that in the next edition he can feature some of the city's famous pottery-shard installations - help shine a light, Chris! 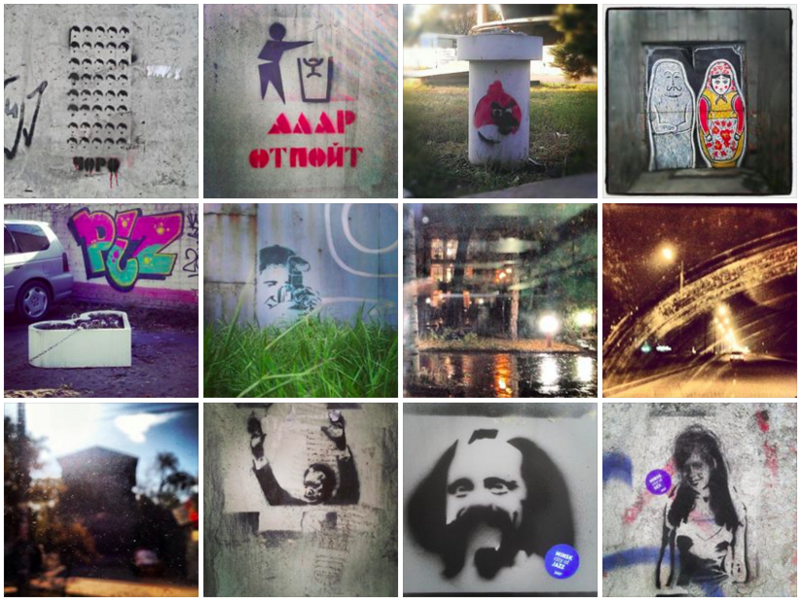 Just over the border in Bishkek, Kyrgyzstan, there's a kindred soul named Joshik wandering the streets, and he's just as fond of street art and mailboxes as I am. Joshik calls his project Photodrift, after the dérive of the French psychogeographers, and like the urban flaneurs before him, his approach ranges from freeform to structured; sometimes, it seems he lets the spirit of the city guide his movements, while other times he'll constrict his route through certain strict guidelines. He frequently walks a single city street from end to end, for example, exploring its history and character through photography. His latest work is a little photozine called Gorod Rasfokuse, or "City Out of Focus." I'm in Bishkek often but our paths, unfortunately, have yet to cross - perhaps there's a collaboration in our future! 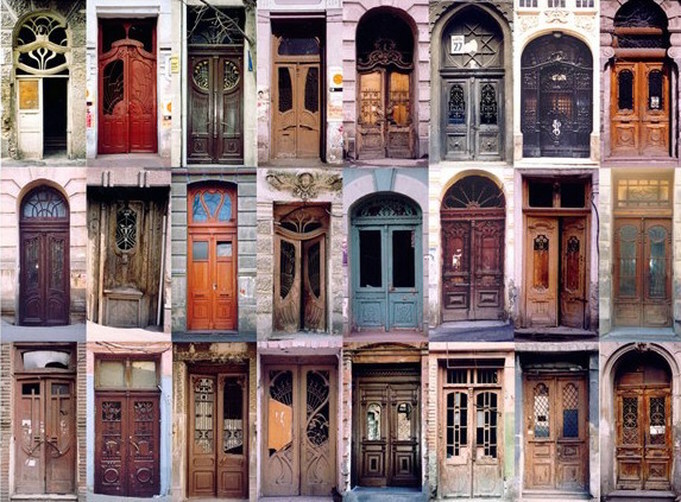 When I visited Tbilisi in the summer of 2014, I fell in love with the city's doors. Unlike Almaty, Tbilisi had loads of architecture from the pre-Soviet period, and in the center at least, grey modernism was hard to find. Instead, the Georgian capital treated me to fabulous balconies, tiled atriums, and thick wooden doors, carved and set with glass. I hardly put the cap on my camera lens, I was so besot. Armed after a couple of days with a couple dozen door photos, I felt like I had a treasure, until I stumbled into a bookstore and found Nodar Sumbadze's Herbarium Tbilisiensis - and Nodar had captured hundreds of them and, what's more, arranged them in intoxicating collage. The book is genius, not just for its botanic metaphor, but for the poetic passages accompanying each photo set, describing the world of the everyday that swirls around these quintessentially Georgian artefacts. If only this book was owned by every documentary urbanist - it seems to be a rarity. Every city has its quirks, but with Shanghai Blink, the French photographers Inès Breton and Vincent Prudhomme have compiled a quirk compendium that is hilarious in its scale. 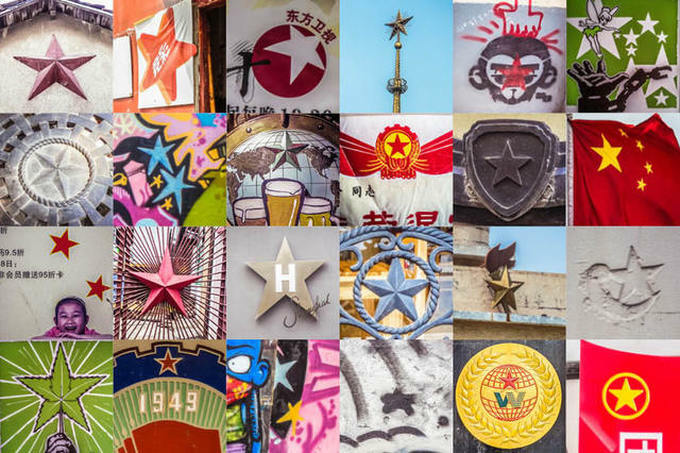 Here are not just architectural details, like the communist stars in the example here, but two dozen dogs wearing sweaters; twelve people napping in public, and a two-page spread of underwear on clothes-lines. I tend to miss these kinds of things in the Almaty landscape because I'm drawn to the aged and the permanent, while Inès and Vincent are drawn to the easy-to-miss: the underwear is there one minute, but dry and folded up the next, the nappers eventually wake up from their slumber. It's that much more remarkable, then, that these documentary urbanists were able to gather as much fleeting data as they did. The other projects I've highlighted focus, as I do, on the particular: the door, the window, the star and the stencil. James Gulliver Hancock's project is altogether different, yet I can't help but feel like we'd get along quite well. 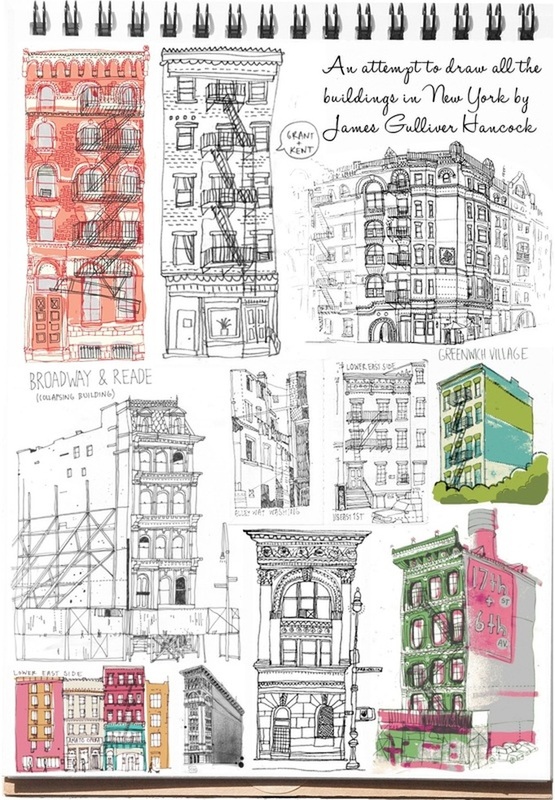 I first heard about his project to sketch "all the buildings in New York" on the great design podcast 99% Invisible, and I immediately laughed and sympathized with the absurdity of his task. I thought it was tough to find every mosaic in Almaty - and James was out to collect buildings in a city where they number in the tens of thousands. Then I realized the documentary significance of it. When you have to draw every last cornice, James explained on the podcast, or piece of filigree, you get to understand buildings on an intimate level. Same, I'd say, goes for cities. Focus on the details and you start to see things in a whole new light. 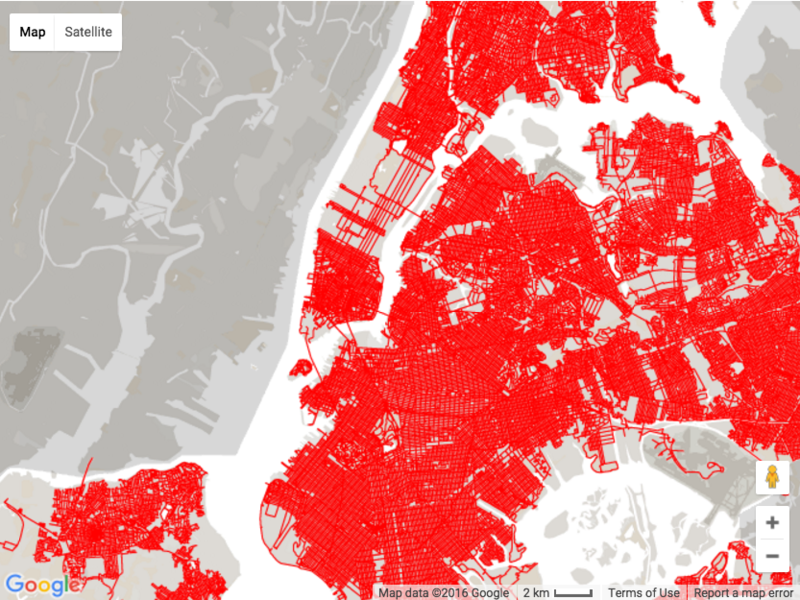 When I saw Matt Green's map of every street he has walked in New York City, I knew I had to get in touch. There aren't that many of us who like obsessively documenting architecture, but there must be even fewer who have had the delusion that they can walk a whole city in a lifetime. Matt, luckily, happens to be disciplined beyond belief, and he's made some serious progress; his red-splotched map puts mine to shame, and he's walking a city with a territory more than twice the size of Almaty!. He's not always "just walkin'", it seems, because he answered my e-mail, and he was super nice, letting me know that he's heard of similar projects in San Francisco and Paris. How fun to know that there's a whole bunch of us, out there nearly every day, chipping away at the pavement. One more tribe to which I can say I proudly belong, a group of curious explorers, walking in solitude but united in purpose.